Fantastic form of the incredibly tough Monterey Cypress. 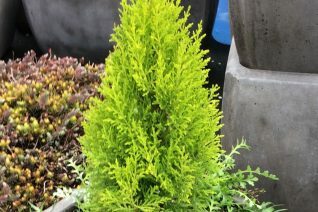 Foliage on this fast growing large evergreen tree is brilliantly hued in chartreuse/gold and acid green. Pinch the foliage and the fragrance of lemons is released. Fast growing tree for poor to average well drained soil. Avoid overly rich soils- which causes rank, unsteady growth. Average un-amended native soils are best. 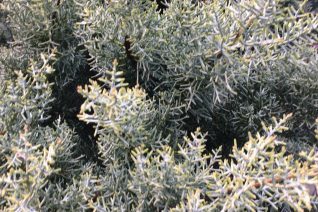 Light summer water to initiate growth and then completely drought tolerant. To 35′ tall x 25′ wide in 15 years. In time it develops a really cool flat spreading crown that this species is so famous for. Great drought and cold tolerance at our nursery. Give it amble room, full all day sun and not much else. Cold hardy to 0ºF. Long lived tree. This species has been placed in the genus Hesperocypress. Remarkable form of the hardy Arizona Cypress. This variety has foliage frosted in chartreuse/cream with interior foliage closer to sea green. A great affect. To 15′ tall but only 4′ wide this is a decidedly fastigiate form of this species. Fast growing tree for screens, specimen. 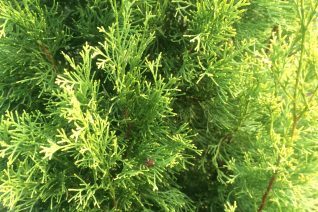 Poor to average soil- avoid rich soil- this causes Cypress to grow to fat and fast in our climate- they get rank and rocky. So plant in average to poor soil with light irrigation until you see appreciable new growth and then none- ever. This produces a more measured growth rate and a sturdier plant. Full sun- from ALL directions- no shade at all. Open exposed sites are best. Very pretty plant that adores our climate. Cold hardy below 0ºF. Rare tree and quantities are limited. Completely drought tolerant. 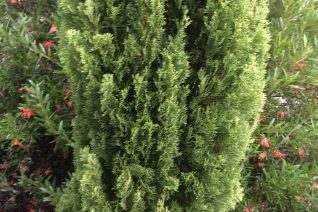 The most common form of Italian Cypress with a strongly fastigiate (skinny upright habit) and blue green foliage. Fast growing tree that demands average to poor soil and little to no summer moisture. Soil that is too rich and too much water in our climate leads to prodigious rank growth and instability. Dry, poor soils and no summer water leads to steady measured growth and no tipping. Full all day sun from every direction. This will ensure thick foliage from the base to the top. 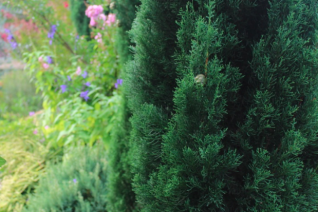 Established plants can easily put on 3′-5′ of growth per year. To 22′ tall and about 18″ wide. Extremely drought tolerant. 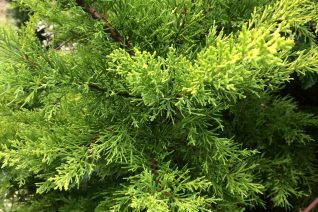 Does not succumb to spider mites or other diseases as Arborvitae frequently can. If it is too tall you may top it and it will re-grow a new terminal leader quickly. Great in containers. Protect containers from temperatures below 10ºF. Takes intense reflected heat with no problem. Great urban tree.